Summary: The Crinkle Crags had always fascinated me simply because of their name and so on my umpteenth trip to the Lake District I decided I would finally explore them. 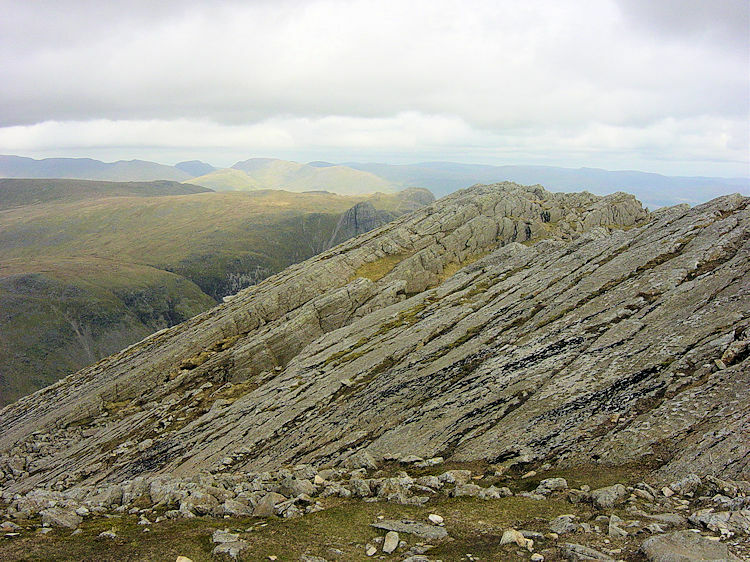 Crinkle Crags are so called because of their profile, a succession of abrupt undulations on a high long ridge. There are five distinct 'crinkles' and in the company of best pal Steve I looked forward to my roller coaster walk over all five. The walk started by leaving Great Langdale and walking due west into neighbouring Oxendale before climbing besides Browney Gill to round Great Knott and then onto the Crinkle Crags. 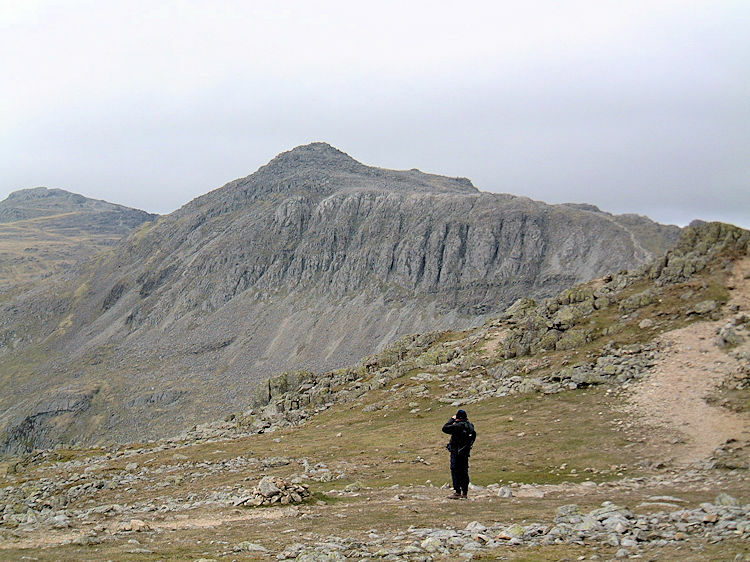 To make the walk even more memorable I had decided to include an ascent of nearby Bowfell, a majestic mountain at the head of Great Langdale and one of England's highest and then a short leg across to Esk Pike. 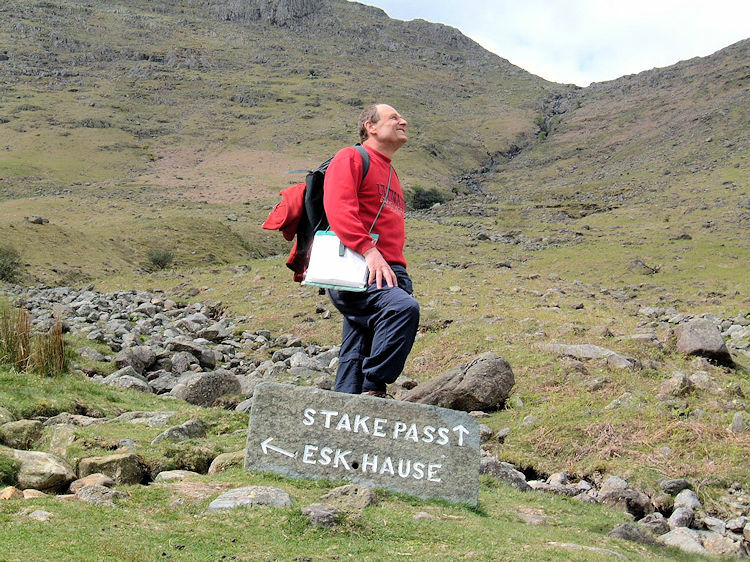 The conclusion to the walk involved a descent to Angle Tarn before a short climb over Rossett Pike to descend by the side of Rossett Gill and finally following Mickleden Beck back to our start at the Old Hotel in Great Langdale. Great Langdale was one of the last places I discovered in the Lake District which is ironic as it is possibly the most popular of all the walking areas in the National Park. Living on the east side of the Pennines led me to believe the Lakeland heights were a place of foreboding and hence my first visits were self imposed challenges overcoming my fears and spent tackling the highest of the areas mountains like Scafell, Helvellyn and Blencathra and by their trickiest accesses such as Lord's Rake, Striding Edge and Sharp Edge. 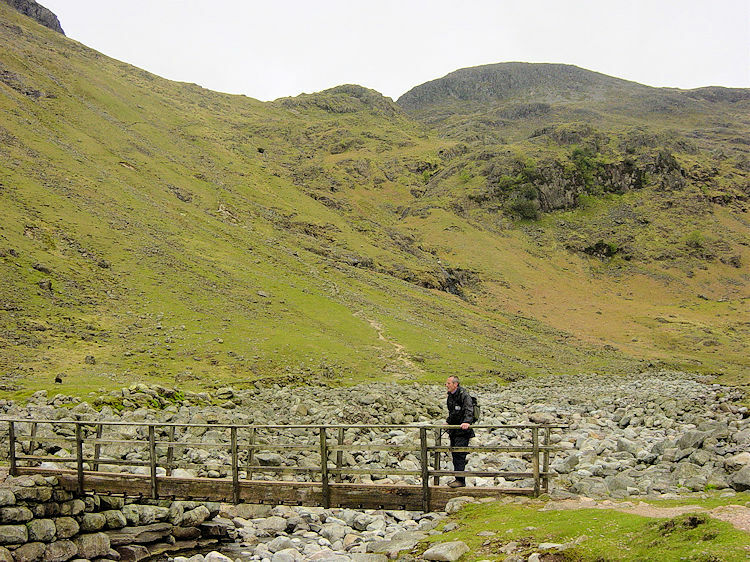 However, a few years ago a few of us went to Langdale for the first time for a walk up Stickle Ghyll to Pavey Ark via Jack's Rake. I have been smitten with the walking in Great Langdale ever since. Further investigation of the Langdale area had focused my attention on an undulating ridge walk at the western tip of Langdale. This roller coaster of a ridge was Crinkle Crags. I spent time at home planning a few walks to do during a five day break in the Lakes. The first one I plotted was Crinkle Crags coupled with an assault on Bowfell, another Lakes mountain I had never attempted before. 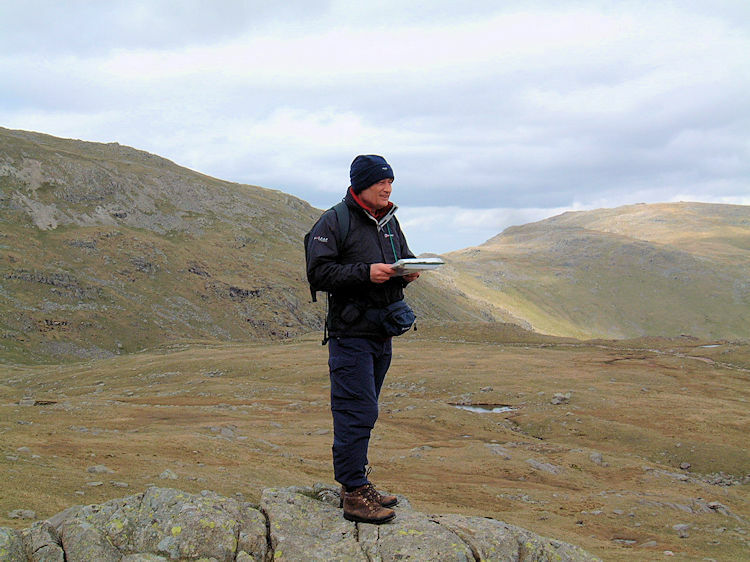 Moreover according to a seasoned fell walker called Paul Buttle the walk I was embarking upon was one of the 12 Best Walks In The Lake District so I was sure I, in the company of Steve was in for a great days walking. This was the second day of a five day break in the Lake District and fortunately the weather was set fair. Even better the cloud though quite widespread was staying above 1,000 metres thus keeping the mountain tops in clear view. This meant I could stick to my planned walks and get to height (Steve and I had both agreed that walking in no visibility was pointless) and therefore take in the breathtaking panoramic views on offer. After parking up in the National Trust Car park near the Old Hotel which Steve exalted by saving the £4.50 parking fee by being a member of the NT we headed off westwards out of Langdale into tiny Oxendale. A short while after passing Stool End, the last farm in the valley we reached a footbridge crossing Oxendale Beck and began our climb. Like the traditionalists Steve and I like to get the bulk of the climbing on a day walk done as soon as possible and so we climbed and climbed first to Brown Howe, then to a fork in the path near Red Tarn and finally to Great Knott. One of the highlights of the initial climb was visiting the impressive waterfall of Whorneyside Force in Hell Gill. 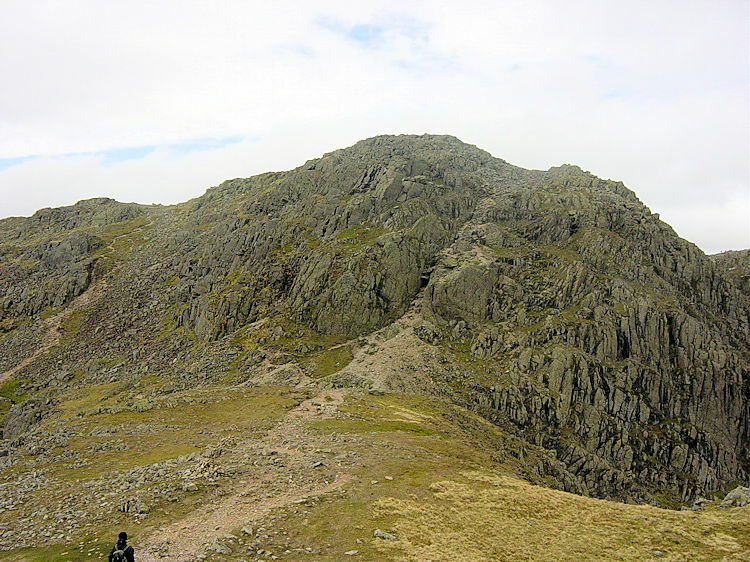 The drag gained us over 500 metres in height in less than 2 miles and soon after Great Knott which can easily be mistaken as one of the Crinkle Crags the going got much easier. 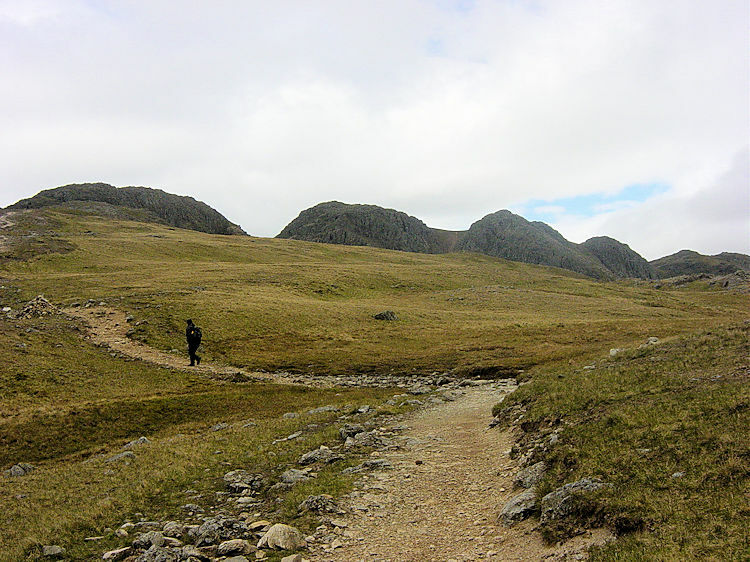 We were now at over 700 metres high and approaching the Crinkle Crags Traverse. 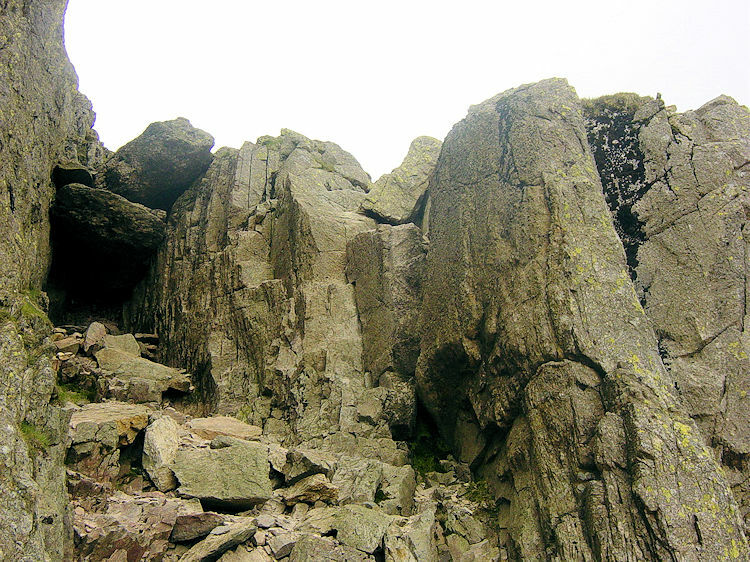 There are several options on how to negotiate Crinkle Crags. As Wainwright himself said "the traverse of the ridge being amongst the grandest mountain walks in Lakeland and strenuous effort will be recompensed by superlative views. Timid walkers will be less happy and may find the mountain hostile but should attempt it: other mountains are climbed and forgotten but Crinkle Crags will always be remembered" Who can argue with the Lakeland sage. Put simply Crinkle Crags can be as difficult or simple as one wishes to make it. 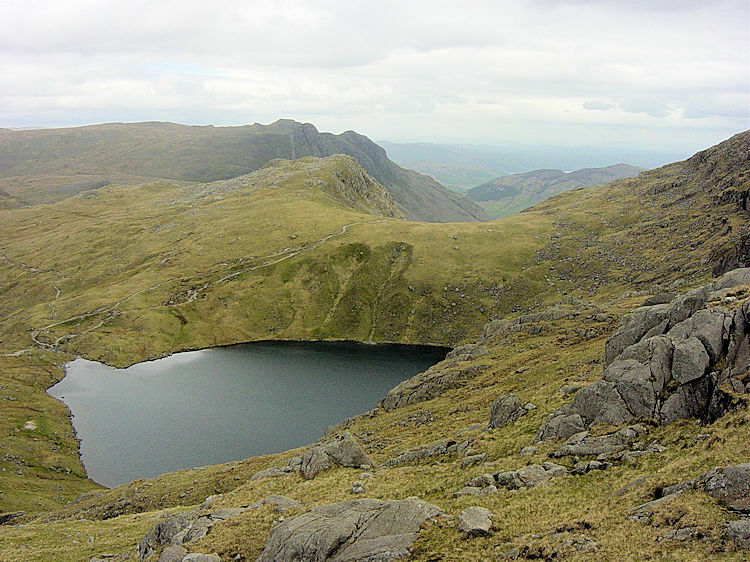 There are a number of paths crossing the ridge and at each crinkle some go round and some go over. The choice is there. Again I quote Wainwright "The measure of enjoyment derived from a traverse of Crinkle Crags from end to end depends on the individual" There is undoubtedly an element of rocky walking but hey, this is the Lake District so what do people expect. Referring to Wainwrights words "depending on the individual" Steve and I took different courses. I am the more adventurous and took the high routes over Crinkle Crags on offer. Steve took the lower side paths. I only had to scramble with hands and feet on one occasion (Bad Step on Long Top Crinkle - see photograph above). Steve had no such problems. 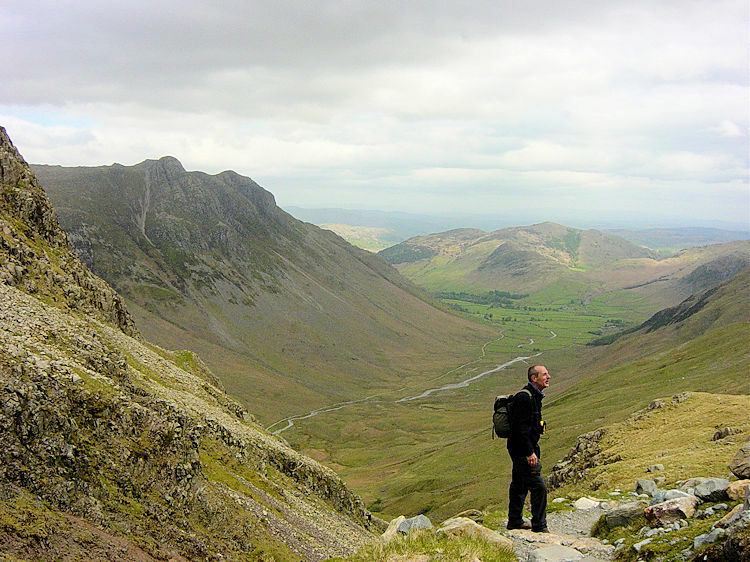 Crinkle Crags are easily manageable whichever course you take. 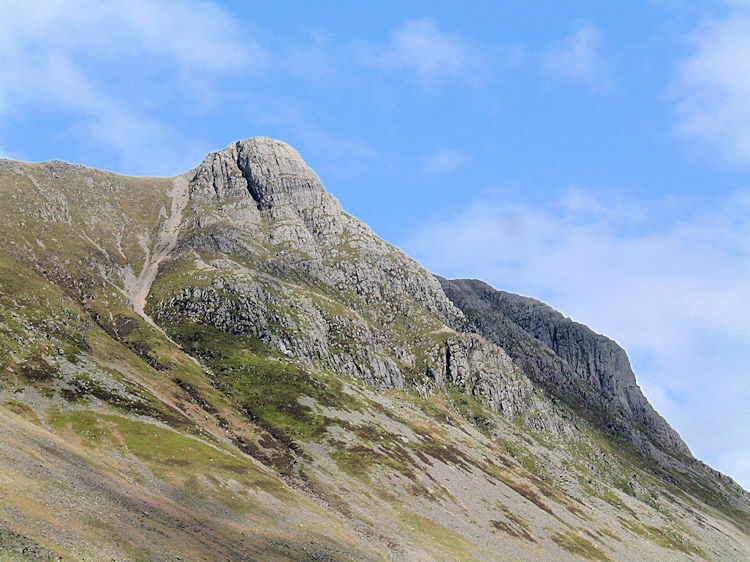 The one certainty about the Crinkle Crags Traverse is the sheer enjoyment of walking amongst them. 'Been there, done that' is a must for any discerning walker. 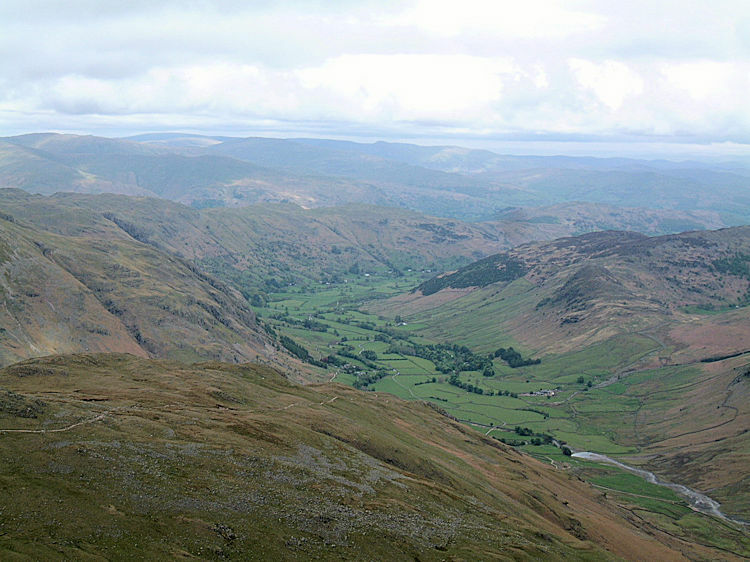 And the views from Crinkle Crags are amazing. 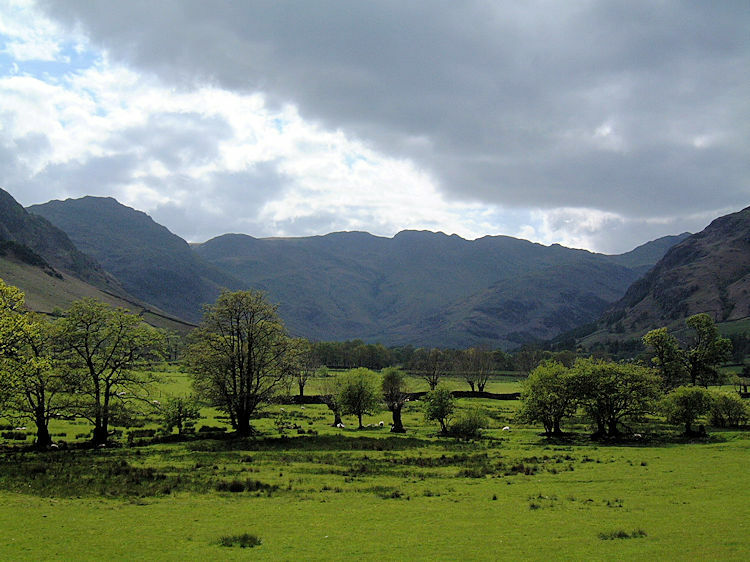 Just over two miles north west are the Scafell mountains and the same distance to the north east are the Langdale Pikes. Look south and the Coniston Fells are just three miles distant. 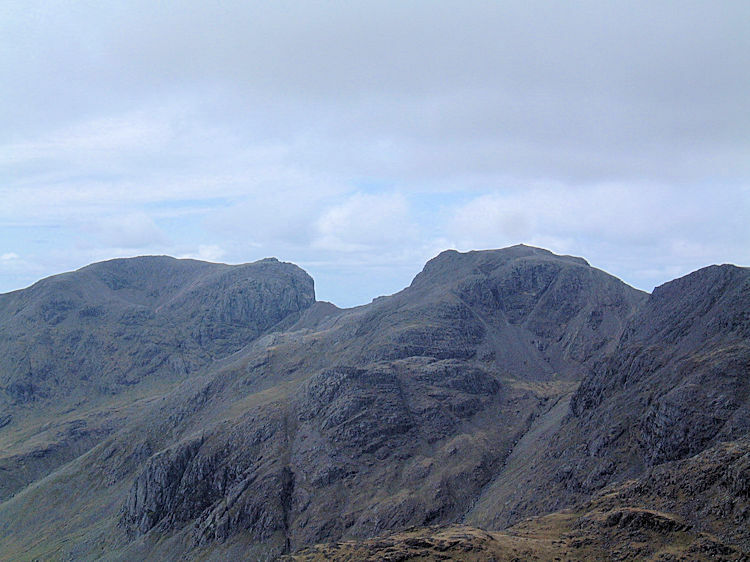 Crinkle Crags is the perfect place on a clear day to mountain spot. Also on top of any crinkle there are hidden nooks and grassed shelters. Perfect places to spend on a refreshment break. Indeed I found a couple of groups doing just that on my exploration of them. Enough of the Crinkle Crags I must get on with the walk but one final thought before I leave the subject. Had I been here in my youth I would certainly have explored every accessible nook and cranny. 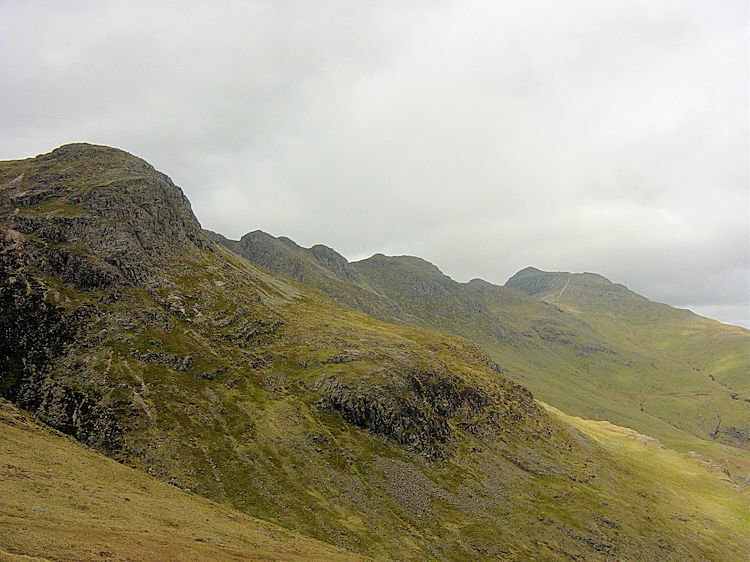 I will try on further occasions but for now a reluctant farewell to Crinkle Crags and on to Bowfell. 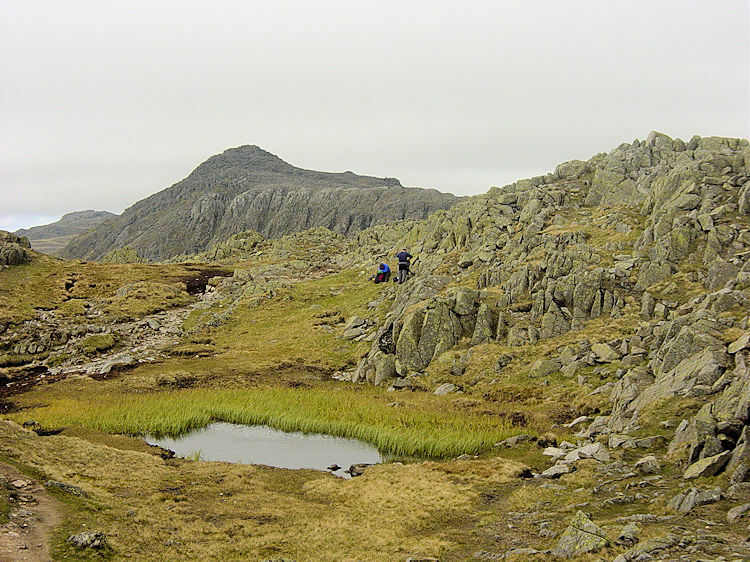 After the excitement of our time on Crinkle Crags we left by walking due north down to Three Tarns which are perched on a saddle connecting the crags to Bowfell. Take time for a quick breather here after all the excitement of the previous few miles. 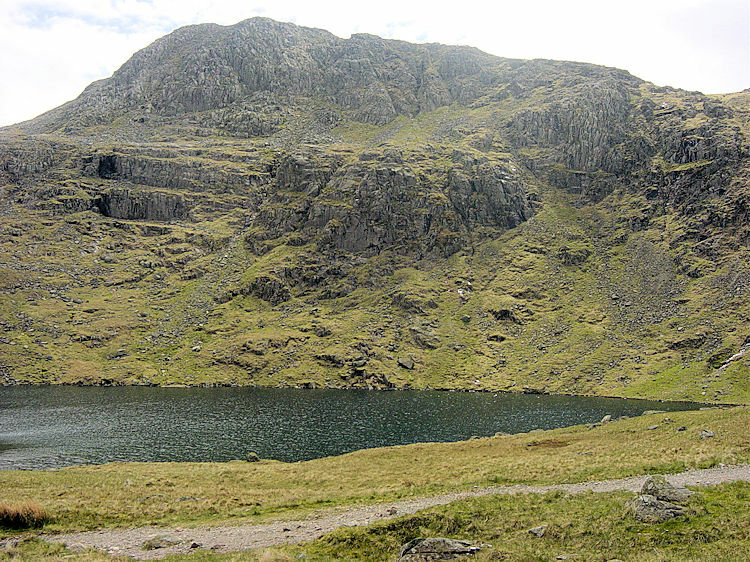 There is a stiff 200 metres ascent to the summit of Bowfell straight ahead. During the climb I took time to catch breath and amaze at the geology of Great Slab. It is an impressive large crevassed lump of rock protruding out of the mountain at about 30 degrees (see picture). Soon after I followed Steve past a group of six climbers onto the boulder field, not unlike the one on nearby Scafell Pike, which is Bowfell's summit. I bounded and carefully leapt over the boulders fixed and unstable in turn to the cairn on top of the mountain. It was a bit cool on top so I nestled into a sheltered recess alongside Steve to take refreshments. I had just got comfortable only to be disturbed by the six guys we had just passed. They requested the obligatory group photograph to be taken. I took two to make sure one was suitable. I took them as quickly as I could and immediately retreated back to the windbreak shelter and to food and drink. After refuelling we continued on the walk from Bowfell by walking north and then west to Ore Gap. The gap flanks Bowfell and its neighbouring mountain Esk Pike. At the highest point of the gap and just a short walk on the other side of Esk Pike is Esk Hause, a place Steve and I have stood many times, often in swirling mist, deciding which path would lead us back to Borrowdale from the Scafell range. On another occasion Dave and I were in thick fog which caused zero visibility at Esk Hause when a group of 20 scouts followed us round in circles trying to find the path. Fortunately we eventually found the right one. No such problems this time at Ore Gap as Steve and I made the short haul to conquer Esk Pike and then back to Ore Gap before descending towards Angle Tarn. The going down the gap was a little squelchy at times and the path often disappeared but we knew where we were going as Angle Tarn, our next immediate goal, was directly below. Further confirmation was the sight of the six photogenic walkers I had snapped earlier just in front of us. It was not long before we reached Angle Tarn where we stopped briefly before moving on with our path taking us on a short final climb round the edge of Rossett Pike and Hanging Knotts to the head of Rossett Gill. 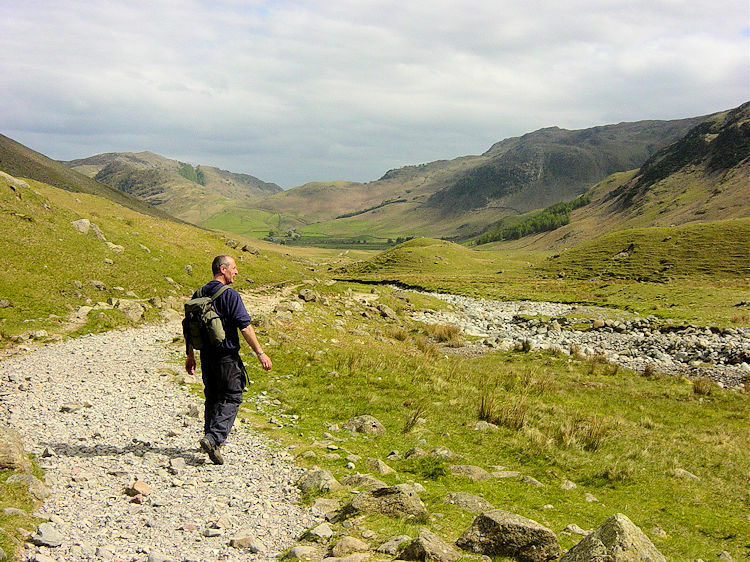 The track, a section of the route connecting Langdale to Wasdale is much maligned by Wainwright. Steep it is to climb and the descent was always taxing but as ample consolation the views to Mickleden and Pike of Stickle from the high position made the effort worthwhile. They are superb. The final section of our walk was great for after the taxing descent of Rossett Gill Steve and I enjoyed a peaceful two mile level ground walk along the Mickleden valley floor back to the car park in Great Langdale. Most of it is spent close to the trickling waters of Mickleden Beck and when we were not glimpsing at the glistening waters in the afternoon sunshine we were enjoying we were looking left to Pike of Stickle and Gimmer Crag or right to Earing Crag and The Band with our earlier point Crinkle Crags beyond. It had been a great walk and we were getting tired towards the end of it. We looked forward to the finish of the walk and as we approached our starting point we looked over to Oxendale plotting out the course we had taken some seven hours earlier. We both agreed the walk had been fantastic. Steve even stopped on the drive out of Langdale to take another picture of Crinkle Crags. It is not often he does that. I was sure we would be back one day. Maybe to include Pike of Blisco the next time?